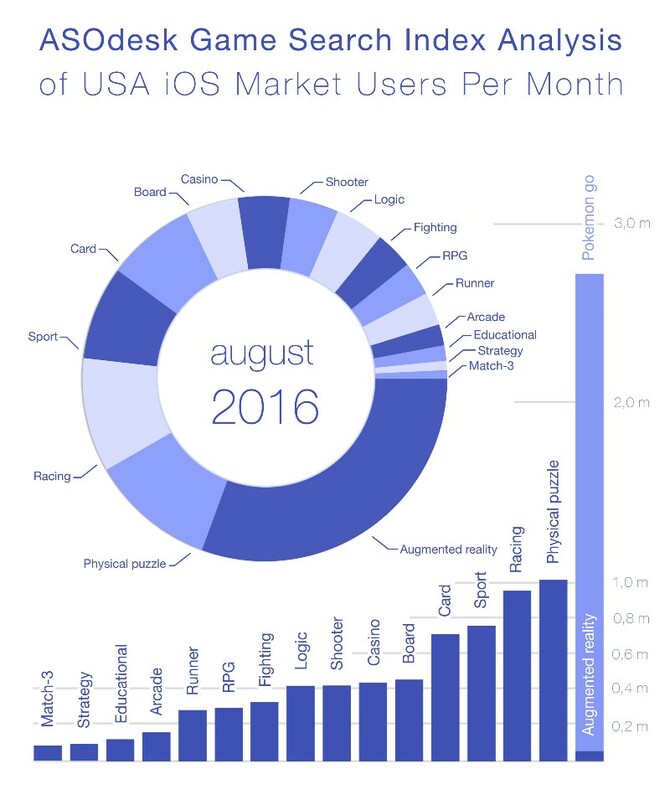 After the release of Pokémon GO, augmented reality has became the most popular subcategory of search request in the App Store. 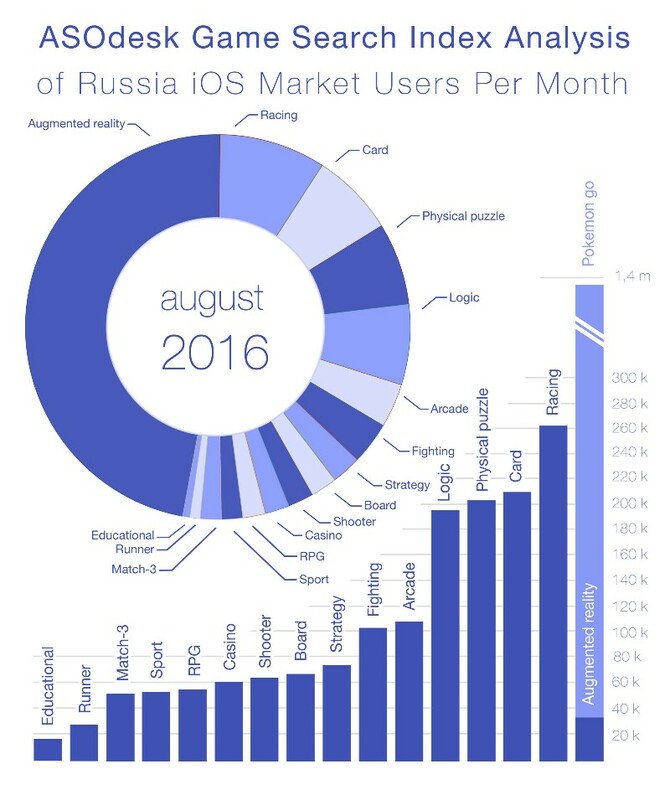 The ASOdesk.com team has conducted its own study of App Store search traffic in the US and Russia — ASOdesk Game Index — and came to some interesting conclusions. The most popular subcategory of games in both countries is augmented reality. (Thanks, Pokémon GO.) Up until a couple of months ago, the popularity of this category was fairly low. The graph shows what the augmented reality subcategory looked like before the rise of Pokémon GO, as well as what it looks like today. In Russia, the leading subcategories are — racing games, puzzle games, card games and physical puzzles. Most unpopular — runners and educational games. Sadly, in the subcategory of educational games there are almost no search queries. Interestingly, in the Russian Store, most people search for games using English keywords, for example, “sniper” or “runner”. In the United States, the main sub-categories are physical puzzle, racing, sport and cards. Strategy and games in the genre of three-in-a-row being the most unpopular. As we can see, a rearrangement of forces has occurred in the mobile games industry. With the introduction of the Pokemon GO to the game sphere, augmented reality has become immensely popular, both in terms of the needs of potential users (increase in popularity and the number of searches), as well as from the point of view of investing in the development of products that fall into the augmented reality subcategory. How is the Index was built? To determine the list of most popular gaming subcategories, ASOdesk specialists used the Top Charts in each country. On the basis of the collected data, they identified 16 most popular subcategories (not to be confused with the game subcategories in the App Store): Educational, Runner, Match-3, Sport, RPG, Casino, Shooter, Board, Strategy, Fighting, Arcade, Logic, Physical puzzle (a la Angry Birds), Cards, Racing, Augmented reality. 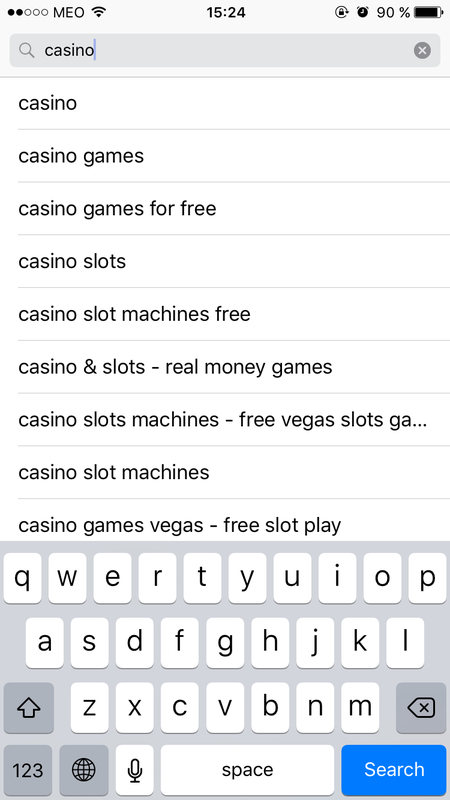 Furthermore, for each subcategory, the store suggestions were determined — in which users are suggested a game related to a particular subcategory. For the study, we used only App Store search suggestions in the United States and Russia, where the index of Users per Day was counted on the ASOdesk.com platform. What are the suggestions in App Store and where are they found? When a user starts typing a search query, it immediately issues a list of suggestions. Suggestions are already ranked by descending popularity, i.e. how often users entered the keywords or clicked on the suggestions.